Captain Calvin Ripley etched his name as firmly in Great Lakes maritime history as he did on Ripley’s Rock in Marquette, Michigan harbor. Captain Calvin Ripley or “Old Rip,” as people along the Great Lakes called him, began his career trading in lumber up and down and beyond the shores of Lake Ontario and along the St. Lawrence River. It is highly likely that Calvin Ripley met Jerusha St. Ores as he sailed up and down the Lake Ontario shore and steered his vessel among the islands of the St. Lawrence River. Since 1819, ship builders had busily plied their tools to build more schooners for the lumber and merchandise trade, including the Henry, Captain John Davis, the Victor, Captain Calvin Ripley, and the Free Trader, Captain Shattuck. Captain Ripley met Jerusha St. Ores, they courted, and they were married around 1830 in Lyme, Jefferson County, New York. “Old Rip” continued to sail the Great Lakes. In May 1830, he was master of the schooner Andrew Jackson out of Oswego, New York, and in 1831, he was the master of the John. In 1833, he was captain of the Richard. While Captain Ripley continued to sail ships up and down the Great Lakes, he and Jerusha began and family and moved west to Illinois, Wisconsin, and then Michigan territories. As Calvin and Jerusha’s family grew and flourished, so did the steady and relentless flow of settlers to the rich lands and economic promise of the Great Lakes region and the western lands that lay beyond. The Erie Canal and a regional network of canals and fledging railroads opened up the area to industry and trade and vessels carrying merchandise and people played an important part in settling the new country. Captain Ripley may have been lured west with the promise of profits and the promise of a good life and plentiful land for himself and his sons. The caliber of his friends and associates spoke well of Captain Ripley’s character and maritime skills. He and Solomon Juneau, one of Milwaukee, Wisconsin’s founders, jointly owned a schooner called the Victory, that they had built around 1836 and enrolled in Detroit on May 12, 1837. 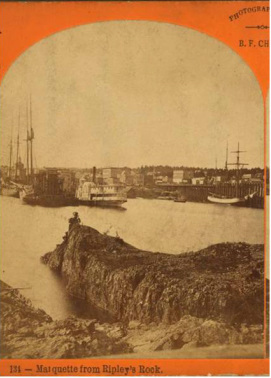 Captain Ripley sailed the Victory and the Kingston Daily News noted that the Victory played an important part in the maritime activity on the Welland Canal, Lake Erie, and the Detroit River. In 1843, the ship enrollment lists reveal that Captain Ripley had changed vessels and now was master of the Free Trader, also called the Fur Trader, engaging in the lumber trade between Milwaukee, Wisconsin, and Manistee, Michigan. Then Captain Ripley expanded his range to Lake Huron and Lake Superior. Navigation on the Great Lakes was still difficult in 1845 and landing at Sault Ste. Marie could be an adventure. The propeller Napoleon made only three or four trips to Lake Superior during the season. Propellers had to anchor two miles off shore and the freight and passengers had to be landed in small boats called Mackinaw boats or scows that were especially built for landings. Cattle and horses were always pitched overboard and made to swim ashore. At this point, most residents of Sault Ste. Marie felt that the only reliable mail, freight, and passenger craft on Lake Superior was the Fur Trader, Captain Calvin Ripley, master. The year 1845 also brought a great copper boom in the Upper Peninsula of Michigan and Captain Ripley’s Fur Trader was brought over the portage at Sault Ste. Marie. He made a good living traveling back and forth between Lake Superior and the lower lakes. Passengers preferred traveling on the Fur Trader and even when a few steam vessels appeared on the lake, the Fur Trader was still popular. It sailed from Sault Ste. Marie to Ontonagon and south shore ports carrying copper down and freight up. The fierce storm that firmly attached Captain Ripley’s name to a rock in Marquette Harbor brewed and broke in September of 1848. “Old Rip’ guided the Fur Trader from Sault Ste. Marie along Lake Superior as usual, delivering supplies and mail to the communities that dotted the shore. Later that month, a fall storm, the worst in twenty years according to local observers, broke out. Waves climbed to mountain heights and Marquette Bay boiled like a pot of water over a leaping campfire. The waves danced wildly, exposing rocks that normally lurked beneath them, and then with another twisting maneuver, covered them up again. Battling the storm, several Marquette residents fought their way to the harbor because they had spotted a ship being tossed by the wild waves. The onlookers on shore prepared to help the ship as best they could. The wave-tossed ship proved to be the Fur Trader, and it plunged straight toward the rocks. The Fur Trader came directly under a huge rock, but then, Captain Ripley., who had been anticipating an opportunity to save his ship and crew and passengers, sprang into action. He grappled and secured the Fur Trader to the rock. The storm raged for the next three days and all of the time the Fur Trader lay behind the rock, tossing like an egg shell. The anxious shore crew built a bonfire to help and feared that the Fur Trader would be dashed to pieces on the rocks and the passengers and crew lost. Finally, the storm died down and Captain Ripley managed to guide the Fur Trader ashore. The storm survivors christened the rock that saved their lives in honor of the captain who saved their lives. It is still known as Ripley’s Rock. Pioneers in Copper Country eagerly listened for the whistle and the creaking and clankings of the Fur Trader and Captain Ripley's hearty greeting as he anchored in L'Anse, Copper Harbor, Eagle River and other Lake Superior ports. Not only did Captain Ripley bring vital supplies for that they needed to survive, but his jovial good nature hidden under a blustery exterior made him a good man to have around. The Peter Crebassa Collection in the Archives of Michigan Technological University contains letters from Peter Crebassa to Captain Ripley detailing their business transactions. Peter Crebassa was the agent of the American Fur Company at Mackinac. As company agent, he traveled the entire Lake Superior region and in 1837, he married Nancy Roussain at La Point. The next year the newly weds moved to L'Anse where Peter worked as postmaster and established a fur trading post and in later years a stone quarry. By 1850, Peter Crebassa had accumulated assets valued at $40,000. As well as doing business with each other, Peter Crebassa and Captain Calvin Ripley were friends and this letter reveals that the two men trusted each other well. Fish, potatoes, and flour were important commodites in Lake Superior pioneer country and these items are listed on the bill that Peter Crebassa owes Captain Ripley. There is also a washing tub for $1.75 and a box of candles for 25 cents. Please let my wife have 50 lbs of pork, and 1 bushel of onions and the balance I put it in your hand. You may give what you please. What you think is right. A story in the University of Notre Dame Archives attests to the warm heart hidden under a rough exterior side of Captain Ripley. He had delivered a consignment of goods to the mission at L'Anse and Father Baraga, who had grown older and more feeble over the years, graciously welcomed him. Captain Ripley just as graciously hovered near Father Baraga and helped him navigate through the evening despite his unsteady walk. Captain Ripley's kindess was as enduring and steady as his rock in Marquette Harbor. Durant, Samuel W. and Pierce, Henry B. History of Jefferson County, New York. Philadelphia: L.H. Everts & Company, 1878. Biographical Sketches, Town of Summit, from the History of Waukesha County, Western Historical Company, Chicago, 1880. A Bit of History, “Small Beginnings of a Wonderful maritime Industry, Sault Ste. Marie News, January 28, 1899, p. 1-5. Memorial Record of the Northern Peninsula of Michigan, Lewis Publishing Company, 1895. Oswego Free Press, Wednesday, May 12, 1830, Marine List.